This book is the first photo-oriented color guide to medicinal plants found in the Amazon Basin. It identifies and describes the uses of more than 120 species of plants in terms that a layperson can understand. In addition to plants of strict medicinal use, other species of cultural and agricultural importance are discussed. Examples include cat's claw vine (uña de gato), soul vine (ayahuasca), dragon's blood (sangre del grado), annatto (achiote), chocolate (cacao), cashew (marañón, the cocaine bush (coca), and curare (curaré). 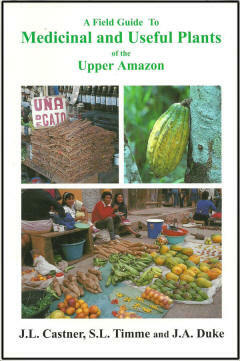 The authors have over 60 years combined tropical experience. Dr. Jim Duke's name is synonymous with medicinal plant exploration. His Amazonian Ethnobotanical Dictionary is a classic, regarded by many as the best reference on medicinal plants of the Amazon. Dr. Stephen Timme is best known for his book Wildflowers Of Mississippi, which is widely used as a guide for the identification of flowers and plants throughout the southeastern United States. Dr. Jim Castner has traveled and photographed extensively throughout the New World tropics and is the author of several books on Amazonian cultures and natural history. 160 pages. 240 color photos. 6 x 9 inches. Perfect-bound (softcover).